It’s easy to pile on pounds over the summer months if you take a “vacation” from healthy snacking. In the past, long hot days meant more exercise, lighter eating and pounds lost. But with high calorie snacks everywhere, it’s harder to whittle your middle. In fact, national studies show that snacking has truly become a “fourth” meal because snack calories add up to 25-30% of total calories. That’s up significantly from the 1970s, when we didn’t snack as much–and were a lot thinner too. Did you know that only one in ten Americans eats enough fruit and vegetables? With so many fruits and veggies at their peak in summertime, there’s no excuse for missing out! For instance, a cup of fresh veggies and a quarter cup of guacamole will cost you less than 150 calories. Avocados are rich in heart healthy fat and also a good source of fiber. Combined with fresh veggies like bell peppers and carrot sticks, you’ll be feeling satisfied for hours. Another healthy and satisfying snack that’s perfect for summer is a strawberry yogurt parfait. At just 50 calories and 8 grams of sugar per 1 cup serving, strawberries bring big flavor along with amazing health benefits! What’s more, eating just one cup – eight strawberries – per day may protect against heart disease, inflammation, diabetes, and even cognitive decline. Try a simple parfait with plain non-fat Greek yogurt, strawberries, a drizzle of honey and dash of granola for some crunch. Summer snacks are a great way to add whole grains to your diet. Not only are whole grains delicious, but research shows they reduce risks of heart disease, stroke, cancer, diabetes and obesity. 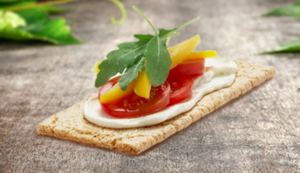 One tasty way to get more whole grains this summer is with a low-calorie crispbread, like those from Wasa. Most are only 30-40 calories per cracker and provide a quarter of your recommended whole grains for the day. They’re the perfect base for building nutritious snacks that satisfy — from savory to sweet. I top them with fruits and veggies and lean proteins. For one of my favorite summertime snacks I use Wasa’s Multigrain Crispbread and top with a thin layer of cream cheese and veggies. Wasa crispbreads also come in gluten free varieties. For more great crispbread recipes, click here. Coconut Date Bars may taste like candy but unlike traditional nutrient-poor treats these pack a nutritional punch of antioxidants, potassium, magnesium, and fiber. You can easily make them by blending dates in a food processor and rolling in coconut flakes or you can buy them ready to eat. They are a perfect portable snack you can take anywhere. There’s a lot more eating-on-the go in the summer months and to help you eat healthier (and save money!) you’ll definitely want to pack your own snacks. A perfect wholesome snack that also travels well is trail mix. For me, a good trail mix has 4 basic ingredients: nuts, seeds, dried fruit and a tiny bit of “fun stuff”, like dark chocolate chips or popcorn. It’s all about balance so just a hint of these extras can make a healthy trail mix super tasty. Try one using toasted pecans, toasted cashews, sunflower seeds, pumpkin seeds, dried cranberries, dark chocolate bits, sea salt, cinnamon, and pinch of nutmeg. This post is sponsored by Wasa. All opinions are our own.